When my song of praise ended, its melody fading into the sounds of the awakening jungle, the baby girl reached up and held onto my finger that had been brushing her cheek. Mercedes leaned over and patted my other hand, soothing the tears that pooled in my eyes. Then her head lifted, and she cocked her ear toward the north, hearing something far too distant for my ears. The bush plane was returning to take us away from the Achuar. I quickly gathered my things together, and we walked back to the village for the farewell ceremony. As a thank you, I had brought a gift with me from home: a bouquet of small branches from the different trees in the grove where I live, wrapped in natural twine. I wanted to bring something of my heart, yet something that would dissolve away as nature intended. As the leader gently touched the redwood and douglas fir and oak leaves, so diminutive and delicate compared to the sizes and shapes of the jungle, the Achuar men gathered around for a closer look. I reached in and broke a bay leaf in half, and their heads snapped back as the sharp scent startled their nostrils. They laughed at their shared astonishment and immediately leaned back in for a deeper sniff. Looking down on the circle of their bent heads, each a glossy black enwrapped by a headdress of red and yellow and black feathers, I felt a stab of distress in my heart. Why had I been brought here? Why had Mystery reached out to me in my cozy bed on a foggy November night and directed me to the Achuar? I was about to get on a plane to leave, possibly never to return, with only an enigmatic dream-interpretation to ponder in search of an answer. I woke with a shot, sat straight up in bed, and knew without question that I had to follow her command. I had no idea how to get to the Amazon, or what in the world I would do once I did. 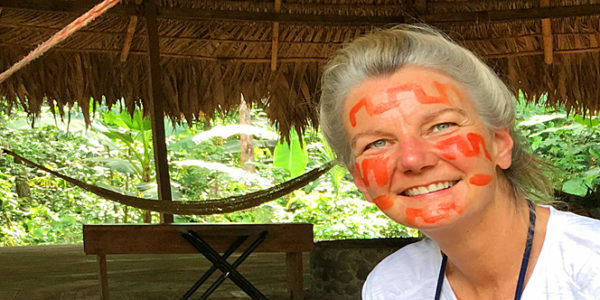 But every part of me knew that I had to find a way, so I Googled “travel to the Amazon.” Within 10 minutes, in the dead of night, I was watching a video of the exact, and I do mean exact, woman in my dream: Lynne Twist, one of the founders of Pachamama Alliance. I had never heard of her before, but it turned out that Pachamama Alliance offered journeys into the Amazon, and within a few weeks I was stepping out of a six-seater bush plane onto a red-mud runway in the middle of the jungle. In the weeks between receiving the dream-command and flying south to Ecuador, even more mysterious things began to happen. I would be woken in the night by whistling. Once I was fully awake, I would see him. Standing at the foot of my bed, watching me. Short and broad shouldered. Shining black hair with straight bangs held against his forehead by a headdress of red and yellow and black feathers. Some nights he would lean in and blow tobacco in my face, other nights he would ring bells in my ears, as if he were testing me. “Yes, I smell that,” I would say aloud, or “I hear those in my right ear” or “That one I hear with my left.” Satisfied, he would fade away, leaving the scent of smoke or the echo of chimes floating around me. His visits had a quality of magic to them, yet they were the most real things I have ever experienced. Please try to understand. I was completely awake. I saw him with my eyes. I smelled him with my nose. I heard him with my ears. I felt the puff of his breath on my cheek. I never doubted the authenticity of what was happening, never hesitated in answering “Yes!” to whatever was calling me to the Amazon. As I prepared for the trip, packing a waterproof duffel with twenty-three pounds of quick dry clothes and mosquito repellent, I kept telling myself not to hope, not to expect that I would meet the man who had been visiting me. But that was ridiculous. Of course I hoped. I was about to travel thousands of miles to accept an invitation from Mystery. The least he could do was be waiting for me. Of course it didn’t happen. The young warrior who reached his hand out to help me off the plane was not the wizened man who had stood in my bedroom. But his headdress was the same, and even that was enough to buckle my knees. And here I was about to leave the Achuar without meeting the man of my dreams. I was leaving with only the enigmatic instruction to tell the world that the Minotaur is real. The elder had explained to me that just as the Minotaur is a single being made up of two seemingly separate species, I was being asked to spread the word that the way the Achuar experience the world – that there is no difference between waking and dream, no difference between the physical world and spirit realm – is true. To the Achuar, both are part of a single, larger reality. I didn’t know why I, of all people, had been given the task. More importantly, I had no idea how to go about it in a way that wouldn’t have me judged as delusional, or worse. I have been asking myself those questions for months now, listening for answers. Apprenticing to the questions, so to speak. And like any good apprentice, I have been sitting quietly at the foot of my master, Mystery, awaiting further instructions. This is so astounding, so profoundly inspiring . . . to see you follow your dreams with such abandon (in the best sense) must give all who read your account the hope that we, too, can find the wall between dreamland and reality a permeable one . . . and task each of us to bring back the wisdom that is found there as you have so ably done. Thank you, Sally, for sharing these profound and beautiful experiences! You inspire me.